Barbie® doll’s intricately crafted ensemble includes a beautiful floral print dress featuring puff sleeves, cinched waist and tufted back pleats. Her small straw hat is adorned with tiny dark and light pink flowers and is covered in delicate tulle netting. The opera-length gloves are made of shirred charmeuse and complete her elegant look. Features genuine Silkstone® body. Ready to paint the town, Barbie© doll is dressed in a striking red cocktail dress. Created in chiffon, the dress features a tiered design and her pillbox hat is accented with a sophisticated satin bow. Elegant accessories include black evening gloves, stiletto d’Orsay pumps, and golden earrings. Features genuine Silkstone© body. Barbie© doll wears an elegant ensemble featuring a black–and–white tweed jacket worn over a black shell and a matching tweed skirt. Accessories include white gloves, sunglasses, spectator pumps, and a fabulous piece: a long, silvery, double–strand necklace, studded with Swarovski© crystals. Features genuine Silkstone© body. This year’s fourth BFMC doll adds a chic new hue to the color palette of Robert Best’s latest Silkstone© creations. Barbie© doll’s form–fitting lavender taffeta and organza dress is accessorized with elegant opera gloves and sling–back pumps. Glittering sequins and beads on the bodice and a mermaid hem lend additional drama. Features genuine Silkstone© body. 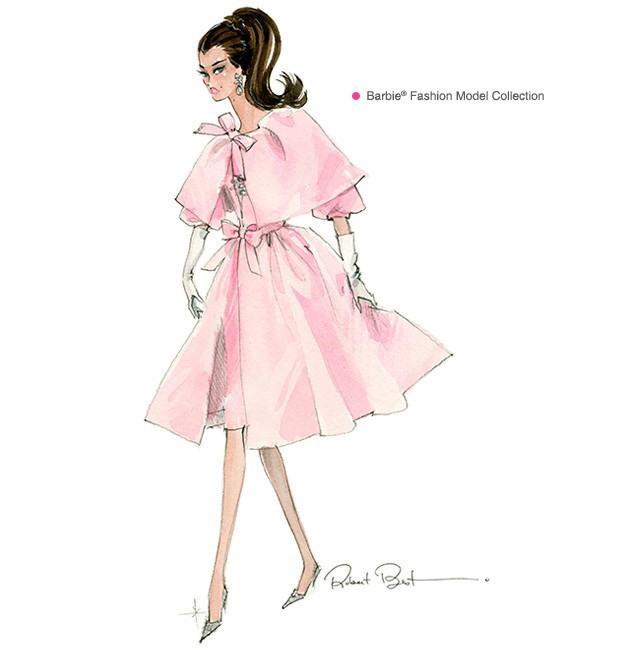 The finale of the 2015 Barbie® Fashion Model Collection arrives in a blush pink, cape-collared coat with lovely bows cinching the coat closed at the neckline and waistline. Remove the coat to reveal a beautifully tailored shift dress, the bodice glittering with micro-sequins.